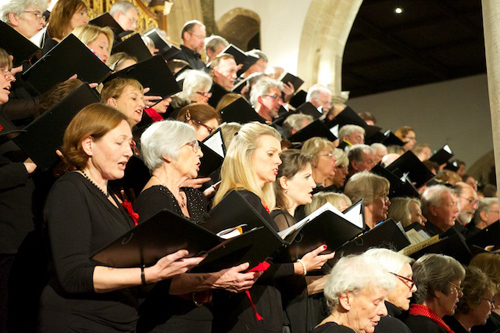 Henley Choral’s 2013 Christmas ‘Fanfare’ exemplified the positive impact of attention to detail on confidence and execution. New Musical Director, Ben Goodson, was thoroughly prepared, and his uncompromising emphasis on quality was echoed by guest ensemble Chaconne Brass, St Mary’s School Choir and organist James McVinnie. Excerpts from Handel’s Messiah provided a meaty challenge to the choir. From the opening And the Glory of the Lord one could tell that Goodson had coached a mellower, more holistic sound from his singers. This was particularly evident in the carol Away in a Manger. Much of the Handel, however, was about split-second precision, the various fugues providing a platform for tight discipline. Goodson’s tempi were invariably comfortable, while his firm, supportive hold gave the choir a secure base from which to express themselves. The bar was set high by the sopranos, a force to be reckoned with. Of the memorable moments, For Unto Us a Child is Born edged it for control, articulation and wonderful contrasts. Chaconne Brass’s reputation was fully validated by flawless renditions of their own witty carol arrangements. The tuba was played with the dexterity of an instrument ten times smaller. St Mary’s School choir also appeared extremely well rehearsed and, with all eyes glued to conductor Keren Milanovic, produced a delightful result. Of their six songs, Christmas Calypso was especially successful. Space was found for quirky readings by Jan French and Myles Carter, as well as audience participation in the usual line-up of traditional carols. Many from this sell-out concert will be back in the spring to hear what Ben Goodson will bring to the Fauré Requiem and Poulenc’s Gloria. For more details, visit henleychoralsociety.org.uk. Meanwhile, more male singers are needed! If interested, call 01491 576929.